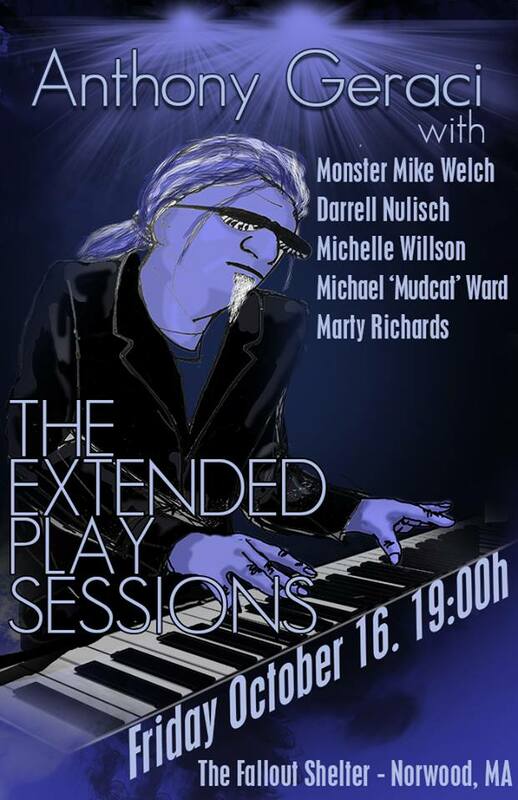 Some of Boston’s very best blues musicians are coming to the stage at The Extended Play Sessions on Friday, October 16th! A very special evening is planned with Anthony Geraci and Friends including Monster Mike Welch, Darrell Nulisch, Michelle Willson, Michael “Mudcat” Ward and Marty Richards. Anthony Geraci has just released his latest solo project, outside of his work with Sugar Ray and The Bluetones, called 50 Shades of Blue which has received rave reviews across the blues spectrum. If you think of any modern blues legend, chances are that Anthony Geraci has backed them. B.B. King, Otis Rush, Big Mama Thornton, Chuck Berry, Big Walter Horton and countless others have had Anthony’s fiery piano accompanying them. Sugar Ray and the Bluetones’ latest release Living Tear To Tear (penned by Anthony) has received seven nominations from the Blues Music Awards-Blues Foundation including: Band of the Year, Album of the Year, Traditional Album of the Year, Song of the Year for “Things Could Be Worse” (Norcia), Harmonic and bass player of the Year, Male Blues Vocalist of the Year. Anthony has been nominated for two 2008 W.C. Handy and the Blues Foundation awards: for best Blues Album, My Life, My Friends, My Music (Severn Records), and for Song of the Year “The Last Words of a Fool” with Sugar Ray and the Bluetones. Anthony was also nominated for a Grammy in 2000 for his work on Super Harps I (Telarc Records) that also features James Cotton, Charlie Musselwhite, Billy Branch, and Sugar Ray Norcia. We’re fortunate to have these incredible players grace the stage and space is filling up VERY fast. If you are interested in attending this event on Friday, October 16th, there is still a small number of seats available and will be confirmed via email. Doors are at 6:00 pm with the show at 7:00 pm and you can be included by contacting them via e-mail at studioconcertseries@gmail.com. Confirmations including the address are issued on a FIRST COME basis. Once confirmed, your seat is reserved. You must email for a confirmation prior to the show. Donation for this event is $25 per person and includes all of the delicious amenities to which you have all grown accustomed… only better! Guests are invited to enjoy complimentary food from our legendary buffet as well as beverages including beer, wine, soft drinks and mixed adult beverages. Beverages and food are available during the filming as well. The Extended Play Sessions at The Fallout Shelter is located just 30 minutes from downtown Boston in Norwood, Massachusetts (minutes off I-95 and Route 1) and has free parking right outside the doors! The $25 donation includes good food and an open bar! Oh, you and about 39 other people will receive a poster that the artist will sign to hang on your wall. Posted on October 6, 2015, in concert announcements, music, Uncategorized and tagged Alternate Root TV, Anthony Geraci, blues music, boston, concert announcement, Darrell Nulisch, Extended Play Sessions, Marty Richards, Michael 'Mudcat' Ward, Michelle 'Evil Gal' Willson, Monster Mike Welch, music, The Fallout Shelter. Bookmark the permalink. Leave a comment.